Trade War Casualities or Business As Usual? Let's imagine you are running a Chinese factory that exports to the US (maybe you are! ), and all year President Trump has been tweeting his intentions to mess you up. How do you respond? I think your choices are: a) do nothing - he's bluffing; b) export like crazy because tomorrow you die; c) get your offshoring options nailed down. What does this do to China's export statistics in the short term? a) nothing; b) spikes them around how; or c) depresses them but pushes up other Asian exports. Now let's have a look at the evidence. First, China's exports are in only so-so health. The headline numbers are better than they have been for a few years: in August exports were up 9.5% yoy, and on a 12m basis they are rising 11.2%. But second, there's really no sign of any current sharp acceleration: in sequential terms, August's tally was 0.1SDs below where you'd expect it to be in August; in July the sequential movement it was down 0.5SDs. These results are not really consistent with the idea there's a lot of extra exporting in anticipation of Trump's tariffs. 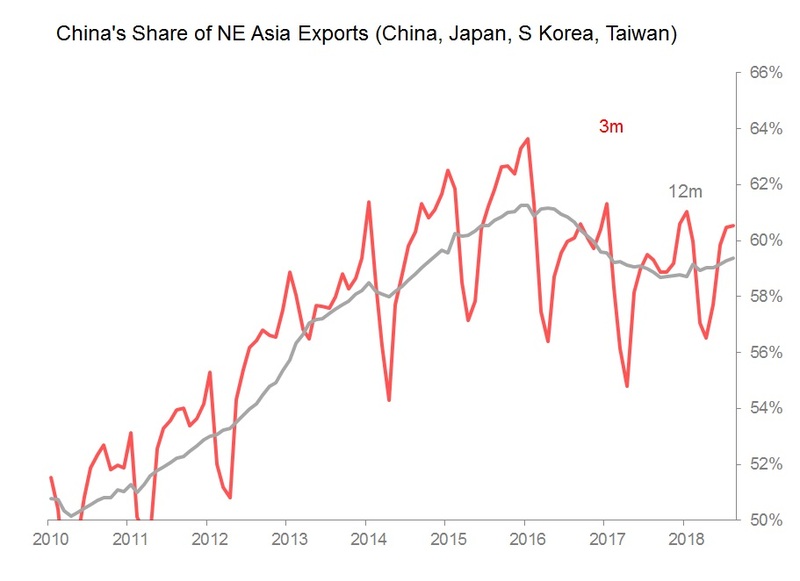 And third, putting China's export data in the context of regional export performance, there's no overall sign that its immediate neighbours (Japan, S Korea, Taiwan) are benefiting from much relocation of demand. In fact, China's share of Northeast Asian exports is rising, hitting 60.9% in August. But, as the chart shows, this recovery of market share has been underway since 2017, with little noticeable acceleration this year. For all the angst, then, the evidence seems to suggest that if you're a Chinese exporter, for now you shrug your shoulders and keep doing what you do best - exporting. Older PostChina Debt: How Dangerous?